To say that I’ve been totally consumed with finishing my book lately would be an understatement. Thankfully I had already planned to take a break before delving into the editing process once I finished. Notoriously impatient, for me that lasted about a week. Anyway…during my week of freedom I went to see The Hunger Games: Catching Fire. I absolutely fell in love with every amazing knit that Katniss was lucky enough to wear. Especially this one! Ugh…it’s so gorgeous! Since I've been off the needles for a while I didn't want to just jump into such an intricate project. Then I came across this beautiful cowl on the Purl Bee. It was perfect since I would get to learn one of the major stitches in the Katniss cowl. 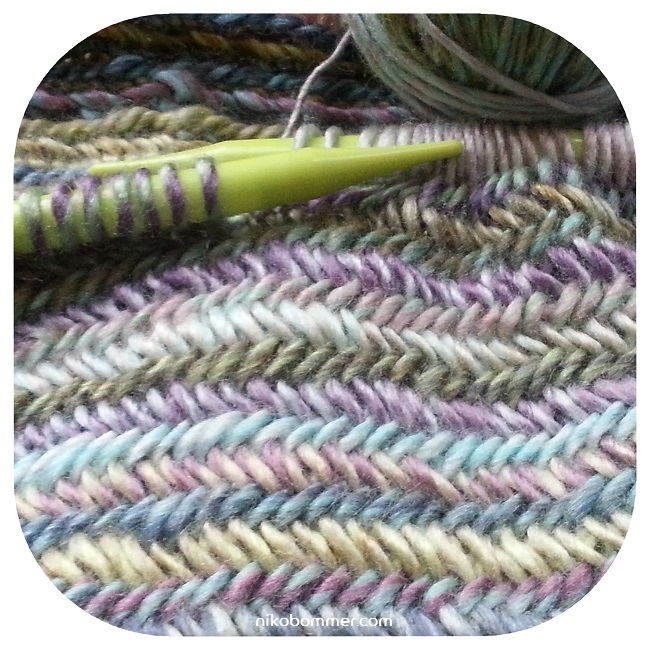 I have to say that I love the herringbone stitch. It is so beautiful and my new favorite. I also plan to knit the cowl in a solid color because I love how rich it looks. Plus, it's freezing in NYC so there is no such thing as too many cowls! Picking up the needles again not only opened up the part of my brain that loves to knit, but also loves to make jewelry. I sadly realized that they had been ignored for months now. For me, creativity usually comes in a powerful wave. I love the feeling of it washing over me, but the problem is that whatever the wave brings tends to be the only thing that I will focus on until I run out of steam. Obviously there will always be one thing that takes priority, but I have to come up with a formula that allows me to indulge in one of my interests without completely abandoning the others. It probably won't be easy or pretty, but I don't doubt that it will be worth it. Have you been able to balance the many aspects of your life successfully? Are you still searching for the perfect formula? Please let me know in the comments below!